This page describes the house itself today. The house is about 4,000 square feet and sits on a third of an acre at 12 Poet drive across the street from the "Locust Grove", Philip's monument and cemetery. Like the Eiffel Tower or Washington Monument it remains the tallest house in the development. 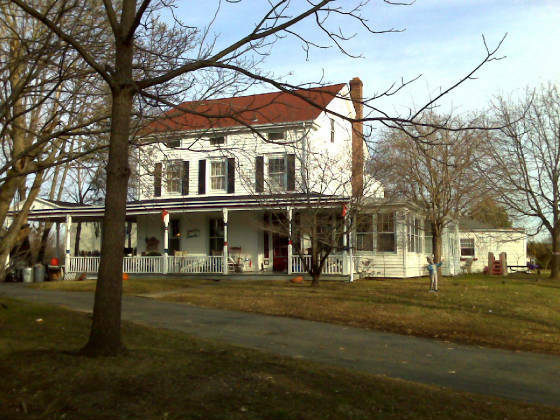 Below is view of the house from Freneau's monument across the street. Fortunately the owners of the last couple of centuries have taken great care of it and it is in remarkable shape to the extent of being reiforced with steel "I" beams and concrete so that its as solid as a bomb shelter. Vinyl siding with styrefoam insulation was added about 20 years ago over about 2 inches of wood exterior so that the house is extremely well insulated. This is a shot of part of the remaining original rubble stone foundation. It is directly under the front door. 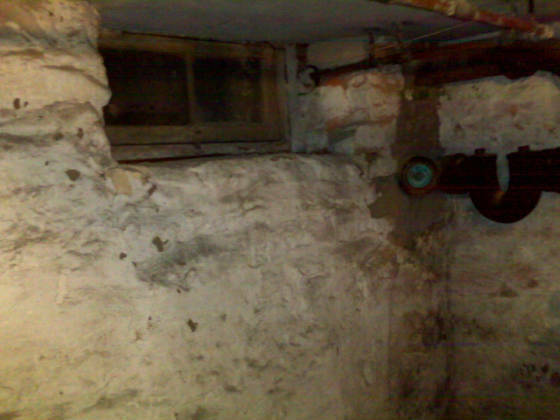 The whole basement is pretty interesting; there are five areas with four doors. 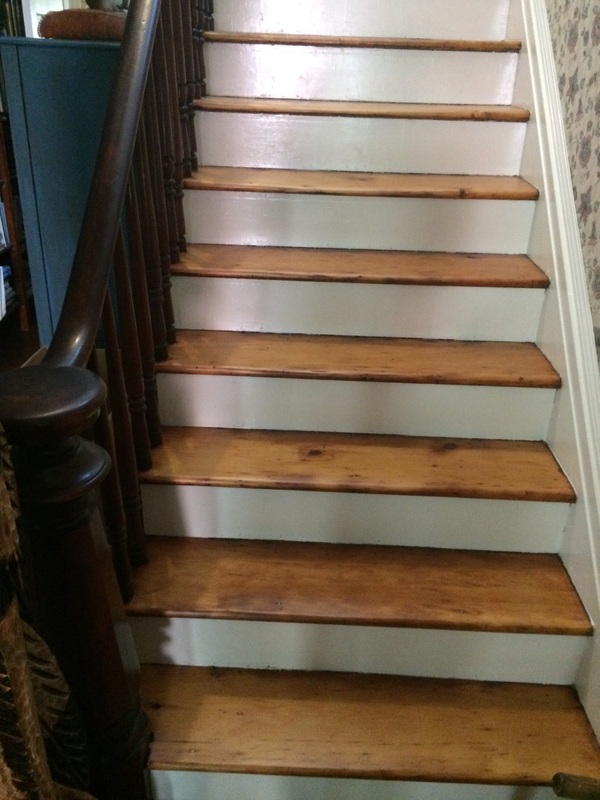 Here are my two hundred year old stairs to the second floor. They appear to be old pine with cut nail construction. Below is a close up of a 70 year old dutchman Fritsch's amazing carpenter put in. There's also a dutchman in the back dutch-door. 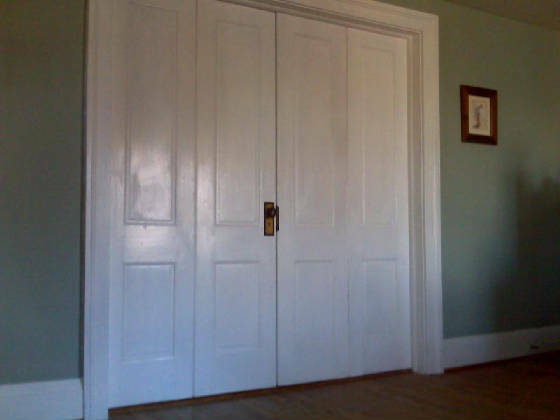 Here is the great Federalist moulding around the doors. There is a very slight angle on the pilaster which I think is very impressive. This particular door presents one of the mysteries as its old original moulding, but on a door to one of the newer (50's) additions. 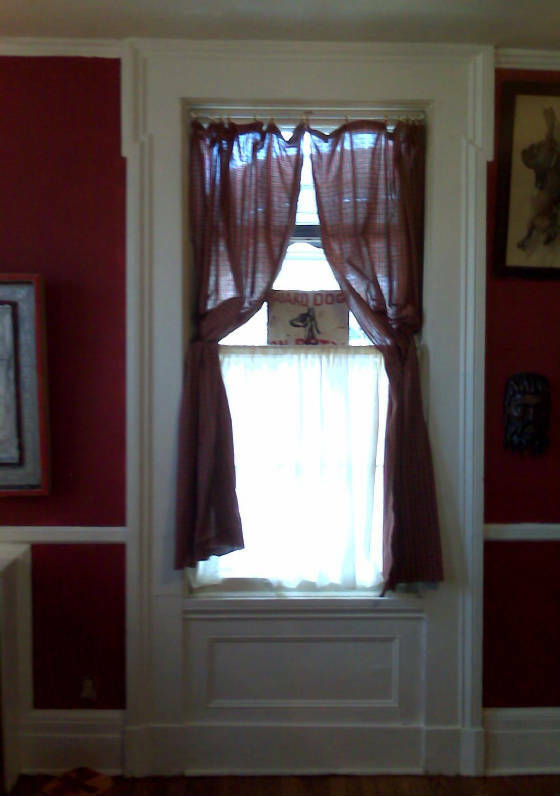 Below is a shot of one of my great "6-over-6" windows. Note the panel underneath. To the left is a detail of the counter wieght and chain mechanism of the original windows. 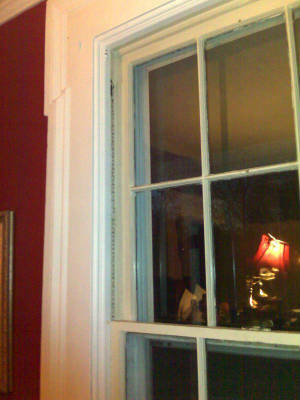 There are some 1950's era windows with a strange tube type mechanism and newwer windows up to the 2000's. and NONE of them work as well as the 19th century counter weights. 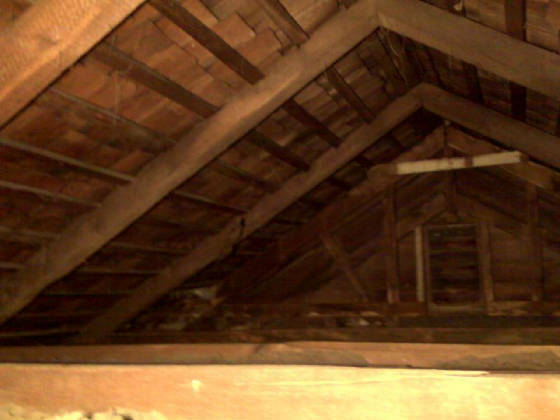 Below are the rough hewn rafters of the roof. The roof is remarkably little bowed after 200 years. A layer of shingles is visible over strapping; over that is planking, then plywood, and finally the courses of modern shingles. I'm not sure if the visible first layer is the original shingles from 1818. 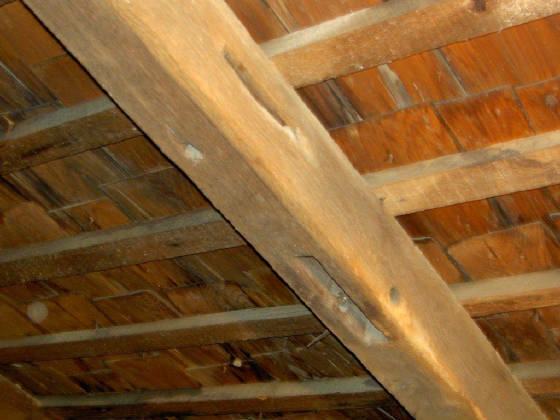 Below is a detail of the mortises in the rafters, which would have received tendons from other beams before the dormers were finished out on the third floor. To the right is the notice from the Redbank register of 1895 stating how J. B. Ryer was remodeling the house for the new tennant farmer. Ryer made a number of nice additions adding Victorian charmed to the original Federalist features which are described below. The first striking feature is the beautiful porch, show below. On the second floor of the original building there are two large rooms. This configuration is probably original. 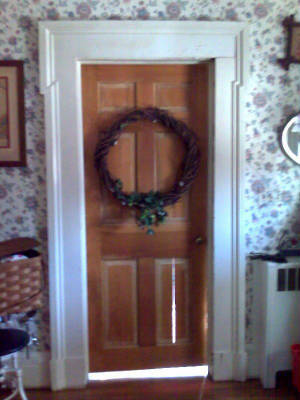 However as shown below Ryer added a door between the rooms. This would have accomodated Victorian sensibilities where seperate bedrooms for husband and wife were common. 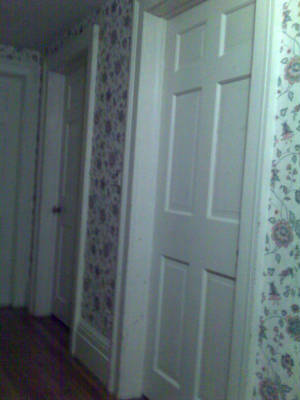 Alternately one room could have been used as a wailing room for small children. 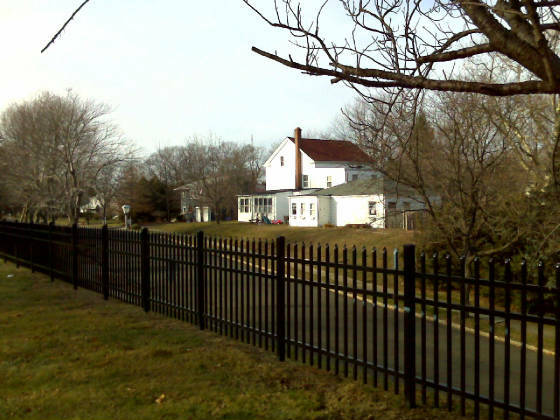 Clarence Ware owned the property from 1918 until 1948, making further improvements as well as resurrecting and publicizing the Freneau connection to the property. To the right is a 1939 advertisement for an auction at which Clarence attempted to sell the property, which by that time had become his 15 acre residential estate, that lists many of the imporvements he made. The house is listed as having 14 room because at the time the old "printshop" and another two-story addition were connected to it increasing the number of rooms by 4 or so. The add cites the hot warter heat, which is one of the features of the house I love. 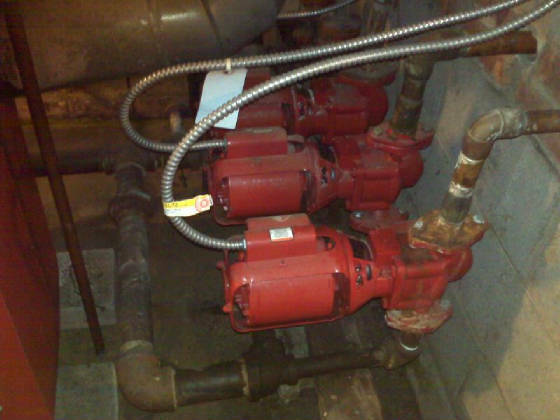 Below is a shot of the industrial circulating pumps that keep the house toasty even on the coldest days with out the harsh dryness of forced air. There are three operational now. Originally there were five, one for the garage, and I believe one was used in an indirect hot water heater for the house hot water. 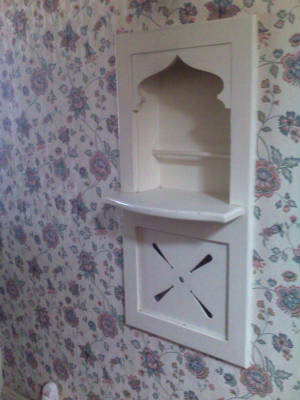 One of the nice architectural details added by the Higgins is the telephone nook that is located in the hallway. The first phone number was "130-W".